Dartmouth Football Club - 01803 832902, Gary Lobb, www.dartmouthafc.non-league.org. Dartmouth Rugby Football Club - 01803 833994, www.dartmouthrfc.co.uk. Dittisham United Football Club - 01803 712333, Mark Riley. Cornworthy Rovers Football Club - committee@cornworthyrovers.org.uk, www.cornworthyrovers.org.uk. East Allington Football Club - 01548 521411, Mrs G Weeks, www.clubwebsite.co.uk/eastallingtonutdfc. Kingsbridge Rugby Football Club - 01548 852038, Jonanthan Robinson, www.kingsbridgerugby.co.uk. Harbertonford Football Club - Steve Jane 01803 732479. Staverton and Landscove Football Club - 01364 72531, Tracy Towl. Stoke Fleming AFC - Details TBC. Stoke Gabriel Football Club - 07779 301282, Mike Calf, www.stokegabrielafc.co.uk. Dartmouth Cricket Club - 01803 832998. Harberton Cricket Club – 01803 845251, Barry Goldsmith www.harbertoncc.com info@harbertoncc.com. Stoke Fleming Cricket Club - 07504 613238, Gil Garland, gilgarland@aol.com. Stoke Gabriel Cricket Club - 01803 782847, Carol Harris, cmc@michelmores.com, www.stokegabrielcc.co.uk. Blackawton Short Mat Bowls - 01803 712159 Adrian Kyte. Dittisham Short Mat Bowls - 01803 722427 Di Fletcher. Harberton Short Mat Bowls - 01803 863014 Jan Carne. Stoke Fleming Short Mat Bowls Club - 01803 770331 Cliff Bailey. The place to come in Dartmouth for kayaking. Regular paddling May to September, all equipment provided. Enquiries from new members welcome both summer and winter. In winter you can join our swimming pool sessions which are perfect for beginners. Contact Tim Freeman on 01803 832663 timfreeman61@googlemail.com or visit www.dartmouthyachtclub.co.uk/. Children aged 8 and over, are taught runs, jumps and throws. Plus activities for Adults. Children: Thurs 6pm. Adults 6.30pm, Dartmouth Leisure Centre. Visit www.dartmouthathletics.co.uk. We warmly welcome anyone who wishes to have a go. Sandquay Road behind the Floating Bridge pub. Contact Chairman - Steve Hawke on 07969 131812 or susan.hawke@btopenworld.com or visit www.dartmoutharc.co.uk. DARTMOUTH ANGLING & BOATING ASSOCIATION Welcomes anglers and non angling social members. Bookable clubhouse for parties and bar open Mon/Wed/Sat from 7.30pm. Membership: Adults £8 Couples £15. Visit www.dartmouthanglingclub.org or contact Clubhouse: Derek Caple on 07717 574630. Dartmouth Leisure Centre, Sundays 10am – 12 noon. Summer: Bell Hill Playing Field, Kingsbridge. Beginners welcome. Winter months on Monday nights 8 – 10pm; summer months 6 – 9pm. Contact: Roger Hern 01803 834888. Located in Victoria Road has a 4 Rink Artificial Surface. During the Winter (Oct to April) we meet at 1pm on Wed and 1pm on Sat (weather permitting), and during the Season we meet on Tues at 6pm for informal ‘roll-ups’. Visitors and novice bowlers are most welcome to join us at these times. Contact: John Tremlett 01803 833020. Pétanque (French boules) is a sociable game, light on regulation and tolerant of all skill levels, allowing complete beginners to partner more accomplished players in harmony. In 2014 a magnificent pétanque piste was created on the edge of the playing field behind the Stoke Fleming Village Hall. The Club meets throughout the year on Wednesdays and Sundays at 10.30 am. New members are very welcome as are visitors to the area who would like to experience the game. 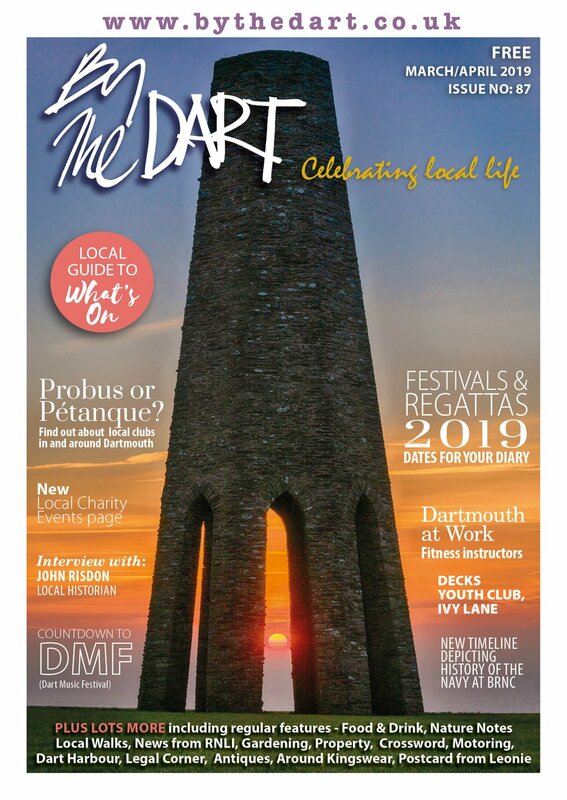 For further information, visit http://dartmouthpetanque.uk. Set up to encourage participation and excellence of performance in all sports, safeguard existing sporting facilities and support improvement and expansion of all sporting facilities, work towards obtaining/building facilities which can be used on a shared basis by all members. Membership is open to any properly constituted sports club or group. Contact Secretary, Yvonne Cottam on 01803 835251 or ycottam@live.co.uk. DARTMOUTH GIG CLUB Membership of all ages and strengths of rowers – everyone is welcome. We row throughout the year training for competitive Regattas which take place all over the West Country, and also for Social rowers just wanting to get out on the river. Contact Club Captain Paul Kunert 07527 095835. Championship golf course, driving range, leisure suite with pool and fully equipped gym. Call 01803 712686. A friendly and sociable ladies team that plays in a Devon-based Petroc Division 2 League. Players are welcome from the age of 15 years and upwards. Training is on Tuesdays, 7pm, BRNC. Contact Siobhan Edwards on 077 348 361 94 or sedwards@valeport.co.uk or visit www.dartmouthhockeyclub.co.uk. DARTMOUTH KARATE CLUB Sundays 10.30am - noon & Wednesdays 6.30 - 8pm at the Leisure Centre. Call Peter Atkins on 01803 833794. DARTMOUTH YACHT CLUB The Club offers an excellent venue for social and competitive sailing events. We offer visiting and cruising yachtsmen the facilities of hot showers whilst a friendly greeting is assured at our bar and restaurant. 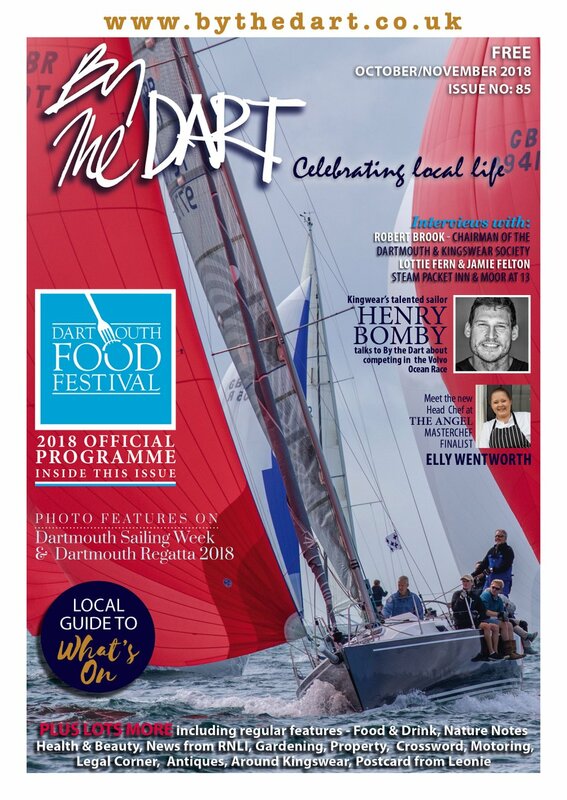 Members, and visitors may enjoy a full season of yacht racing and events whilst ‘non-sailors’ can enjoy a full and active social diary. 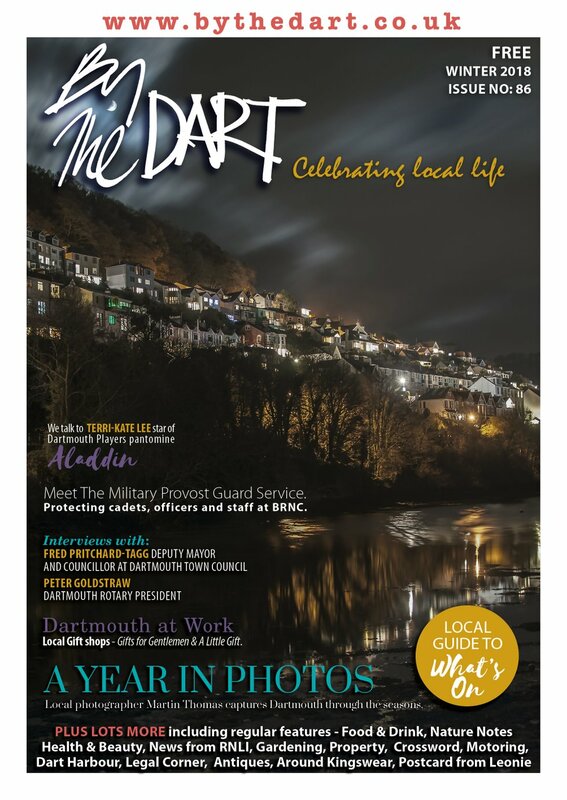 Call 01803 832305 or visit www.dartmouthyc.org.uk. DITTISHAM SAILING CLUB Organised activity mainly centres around river based dinghy sailing with a junior section meeting on Saturdays, a Ladies section meeting on Saturdays and All-member Portsmouth Yardstick Handicap based racing on Sundays. Occasional cruising events. Hon. Sec. Phil Unitt on 01803 722599 or visit www.dittishamsc.org. Study and practice of mind and body co-ordination, under the Direction of Sensei K Williams. Tues 7.30pm Dartmouth Academy. Settle disputes in traditional style, but with modern levels of health & safety. Fencing is a fun and excellent way to improve fitness, flexibility, balance and co-ordination. All ages; equipment provided – no prior experience necessary. Thursdays 7-9pm & 6-7pm (beginners), Kingswear Hall. Contact Alan Payne on 07971 887874 or fencing@overcreek.co.uk. A thriving organisation for young people (over 11 yrs) and adults who want to get out on the Dart to row. If you would like to step into a fourman or pair-oared boat for a trial row, contact www.kingswearrc.co.uk or contact club secretary 01803 75291. Walking to fitness! All ages and abilitites welcome. Contact: Peter Boult 01548 531701. A typical village bowling club in unique surroundings which provides a facility for people of all ages to participate from early May to late September. Anyone wishing to try their hand are more than welcome to contact Mike and Gill Jordan on 01803 770008. ROYAL DART YACHT CLUB The Club has a rich history and sailing tradition but remains thoroughly modern and informal. Our goal is to enable members to pursue their interests across all aspects of sailing. We have a wide range of sailing-related activities plus a busy and friendly social programme. Contact 01803 752496 or visit www.royaldart.co.uk. Thurs evenings, 8pm – 10pm. Contact Tim Freeman on 01803 832663. Free, Contact Kate Wright on 01822 813571 or kate.wright@southhams.gov.uk. Visit www.wfh.naturalengland.org.uk.